There are so many places I want to visit and write about in this area I call “The Thai Riviera” that I have a long list. But they are almost all outdoors, and to do justice to them I need fine weather. Unfortunately, right now, the weather is anything but fine. Although we have escaped the torrential rains in the North, which have caused extensive flooding, the weather is still not what you would call “pleasant.” Dark skies and heavy clouds do not make for great photography, and the threat of getting a good soaking somewhat detracts from the pleasures of outdoor activity. 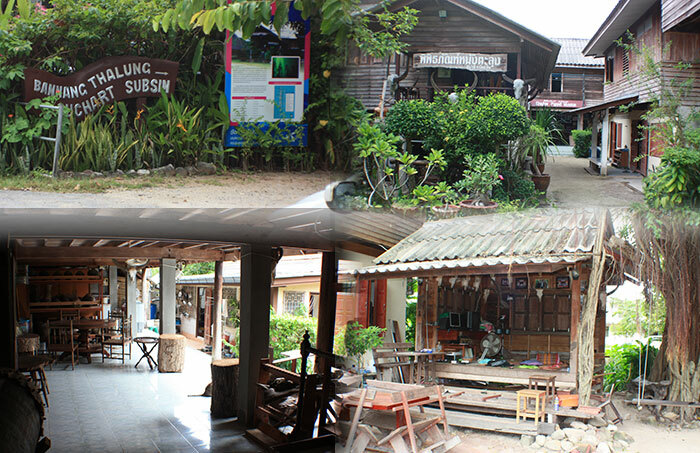 So yesterday I headed down to Nakhon Si Thammarat to try some indoor activity. Finally, I managed to find a place called “The Shadow Puppet House.” I say “finally” because this was my third or fourth attempt! There are some absolutely fascinating places to visit in this part of the world, but all of them seems to be well hidden, and devoid of any meaningful directions to find them. This is not helped by the fact that other than the two narrow main roads which run North-South through Nakhon, the rest of the city is a warren of one-car-width lanes, many of which end abruptly without any visible means of being able to do a U-turn. So, recovering from even the smallest error can take a long time. 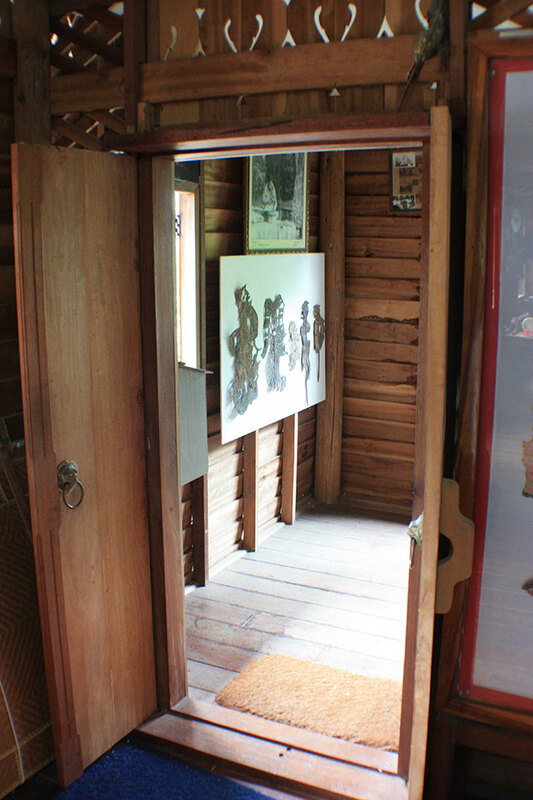 As it happens, once you know the location of The Shadow Puppet House, it’s really easy to give directions. If you are travelling South on the main road, you turn right immediately opposite the Caltex LPG gas station. That’s really all you need to know. Telling me it’s at “6 Si Thammasok Road, Soi 3” really doesn’t help, because there’s no way to match that with anything on Google Maps. Anyhoo, as you can see … I found it! 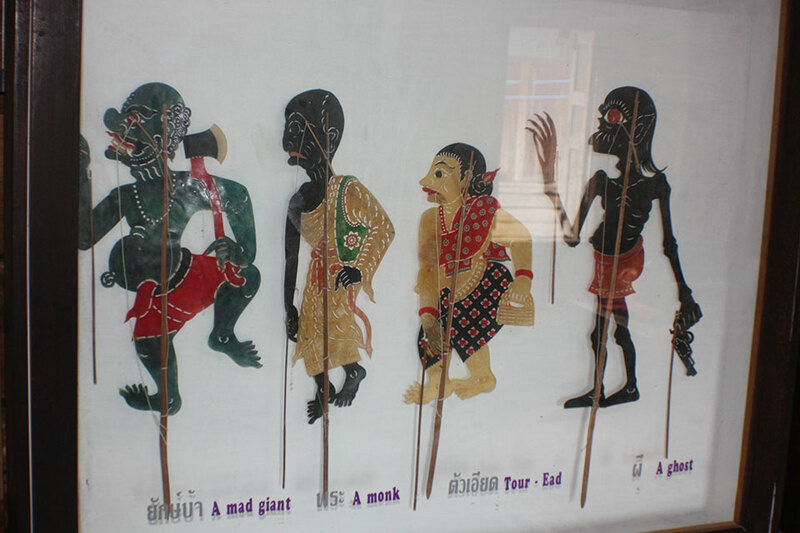 The “House” is owned by Khru Suchart Subsin who, now 77, has been a puppet maker since the age of 14. He is still active in the business, although sadly yesterday he was unwell and so I didn’t get to meet him. But everyone who works there are family members and equally skilled in the art of puppet making. 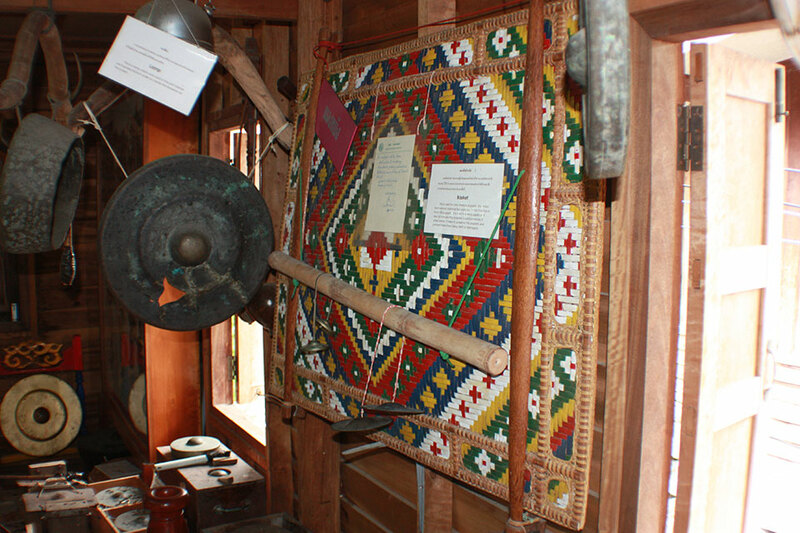 I started my tour in the museum. 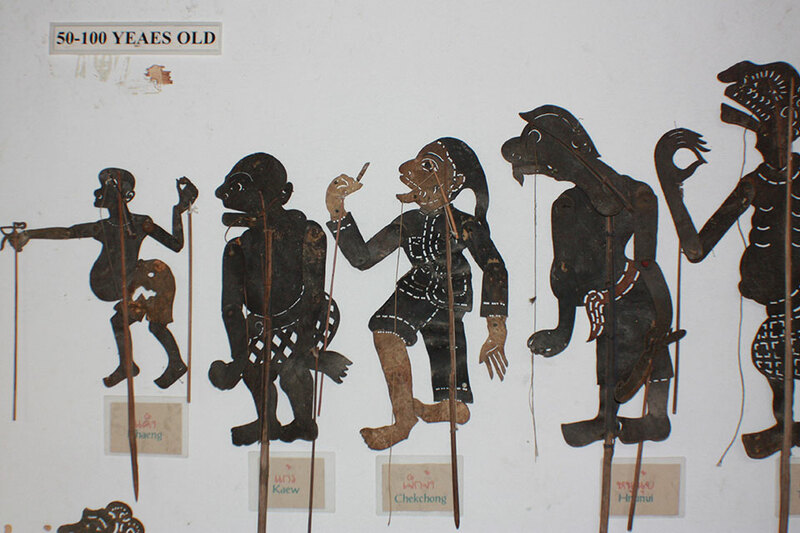 It houses all kinds of shadow puppets from the around the world, some, several hundred years old. 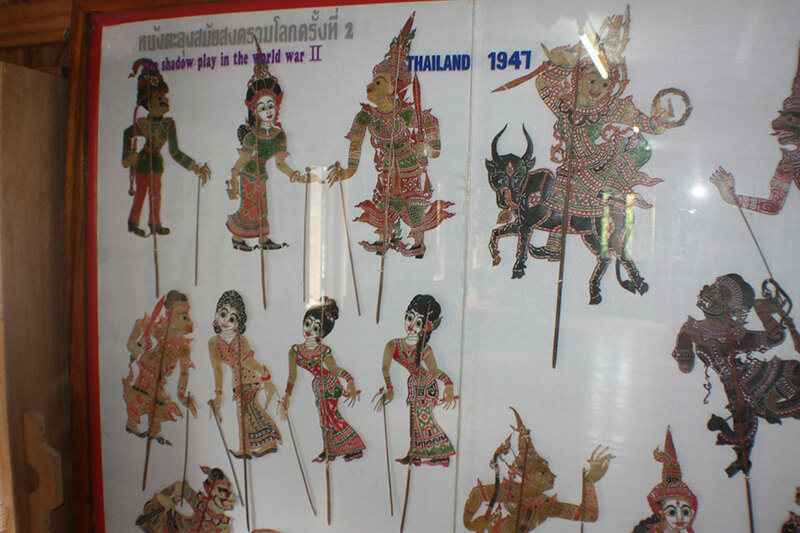 I think my favorites were the small Thai ones – maybe 30cms tall – which had to be used during WWII, when lighting and loud sounds were not permitted, so everything was miniaturized. 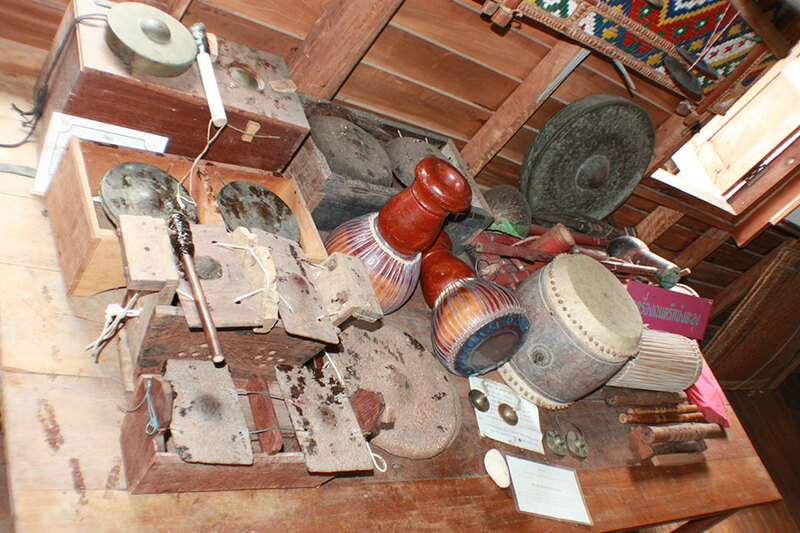 There’s lots more in the museum, like the instruments that are used for the accompanying music during a puppet show, and the cases that are used for carrying the puppets from one show to another. 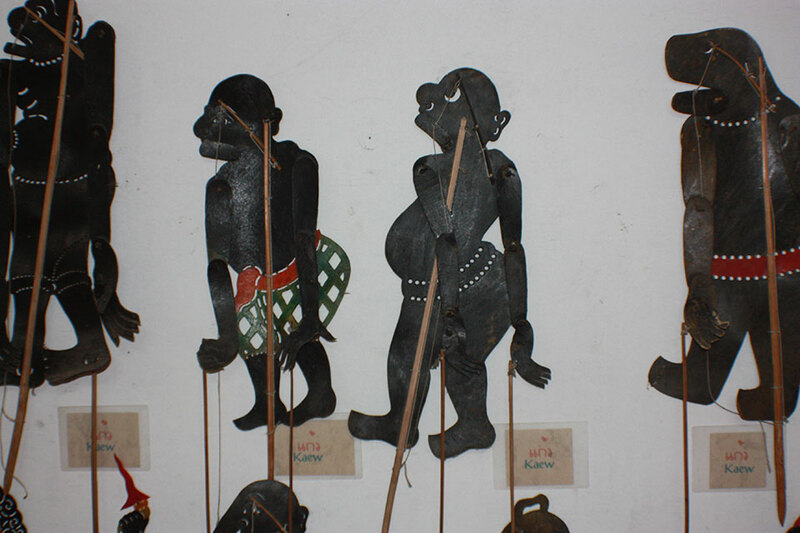 However; it’s not a large building and probably 15 to 20 minutes is all you need to take in the variety of puppet styles, and to absorb a little of the fascinating local culture. From there I was ushered to the building where puppet making was taking place, and as far as I could figure, takes place every day of the year. For me, this was the highlight. 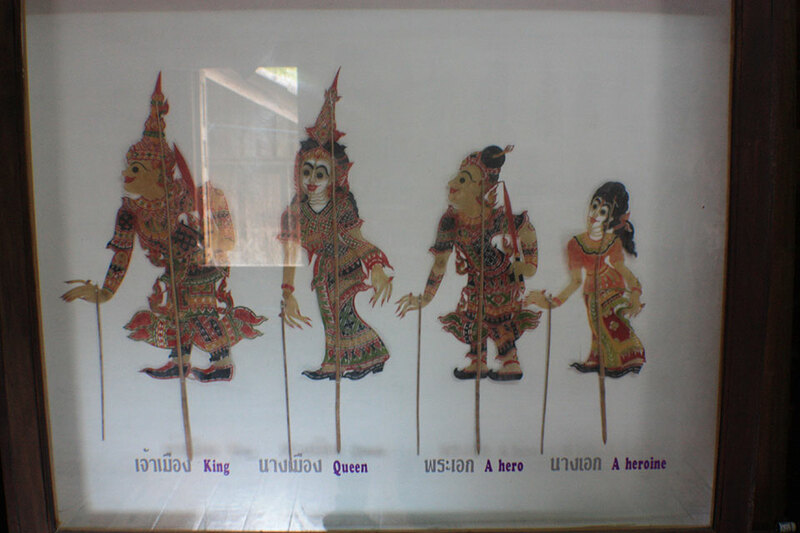 I probably spent an hour of so chatting with the two puppet makers, and comparing the Thai and Malaysian style of puppets and shows. I was the only visitor, so it was easy to take up too much of their time! 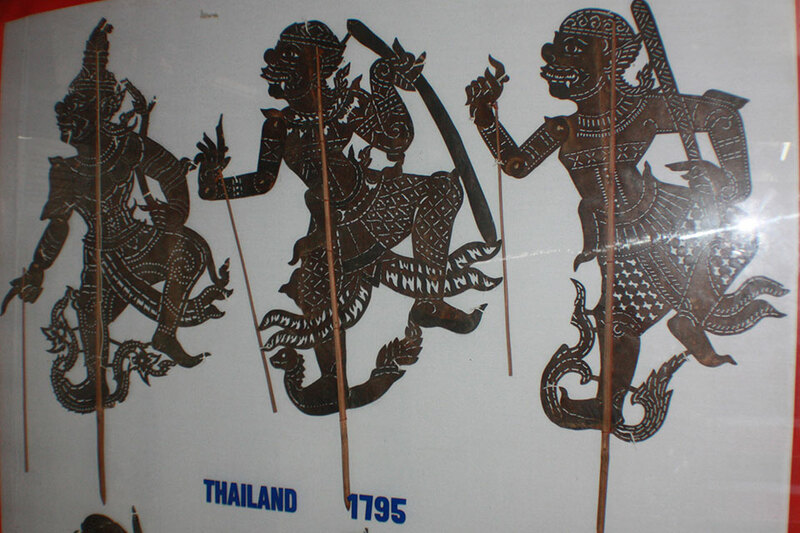 As an aside, many many years ago I visited a puppet maker and attended a shadow puppet show in the Malaysian state of Terengganu, a rather remote area in the Northeast of the country, not too far from the Thai border. This was in an evening, as they always are, because without darkness you wouldn’t see the puppets, which enact an elaborate story behind a backlit screen. Some stories are so elaborate that they continue well into the night and sometimes for three or four consecutive nights. I expected to be bored after ten minutes. I mean, after you’ve seen a few puppets telling a story, accompanied by a dialog you only vaguely understand, along with some weird music, you’d expect ten minutes to be more than enough. But sitting on a square of newspaper in a grass field, I suddenly realized I’d been there for three hours! Somehow the whole effect is hypnotic. The music is trance-like. It’s quite bizarre. But, the three hours didn’t feel like much more than ten minutes. 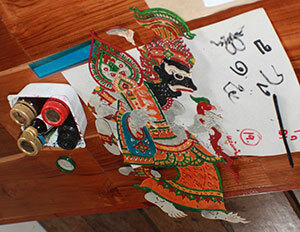 Anyhoo, the actually making of the basic shadow puppet doesn’t look overly complex, but the final decoration has to be carefully applied to ensure the authenticity of the puppet’s character. 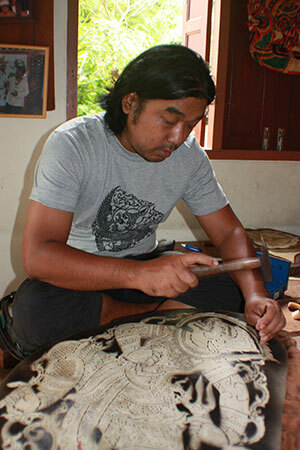 They are made from cow hide. The hide is first “marinated” I guess you’d say, in a mixture of vinegar and honey for a couple of days, to make it more supple and malleable. Then, a piece is cut, a little larger than the final product. 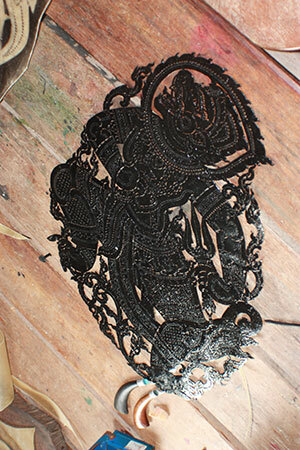 A metal stencil is placed over the hide, and the whole thing is sprayed with black paint. Which explains why the stencil is very very black. Only now it does it occur to me to wonder what they used before aerosol spray cans were invented! Next time. 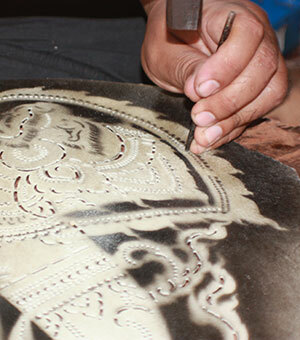 As you can see from the pictures, the stencil has many holes, which is where the paint goes onto the hide, and which in turn, tells the puppet maker what parts to cut out. This, she or he does, either with a sharp knife for the larger holes, or a center punch – which is first dipped in soap – to knock out the small holes. Next is the painting, which is applied either with a small brush or a thin bamboo stick. Et voilà – one shadow puppet! 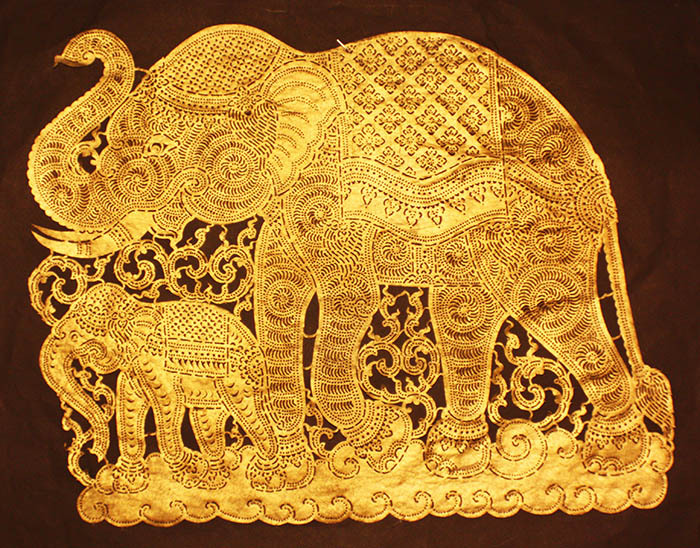 The actual making can take anywhere from a day to a week, depending on the size and complexity. 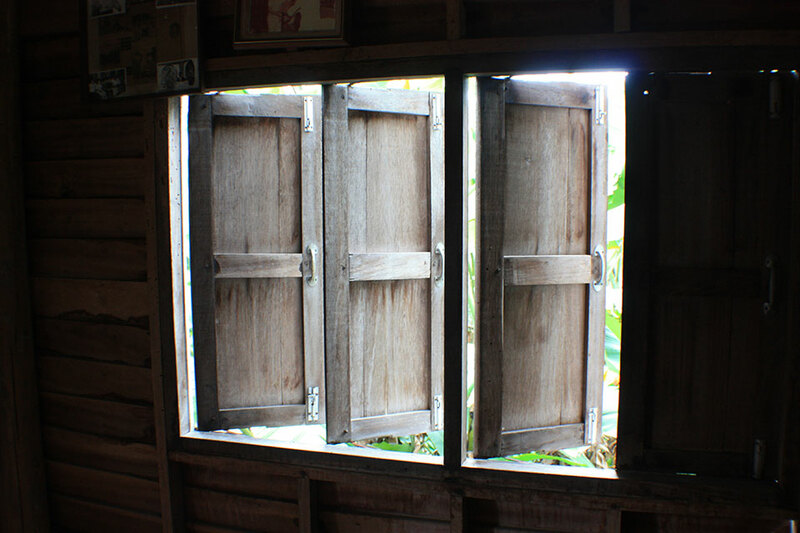 He explained he would have to incant various prayers and chants – what I would irreverently call “mumbo-jumbo” – before he could allow anyone to see them, and that they could not be in the same room as the “good” puppets. 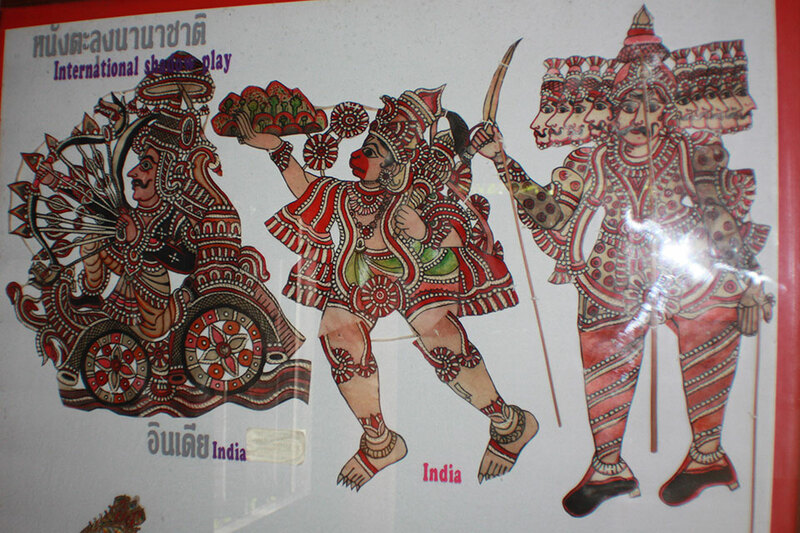 How shall I politely say?… the Thai puppeteers seem to have a more practical attitude. All in all it was a good visit, and I’m happy that I eventually found the place. I would recommend a visit, and if you happen to be in a group of five or more, you can experience a twenty minute show for a small fee. Now I have to decide what to do with the creation I bought. 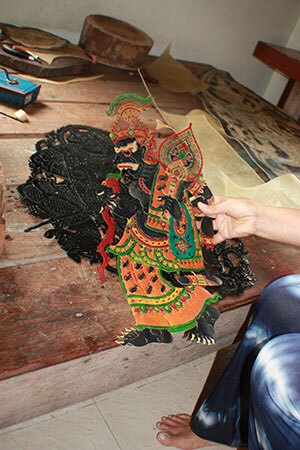 It’s not a puppet per se, but made from cow hide using the same method. It’s about 40x30cms. I guess a nice gold colored frame would be best. 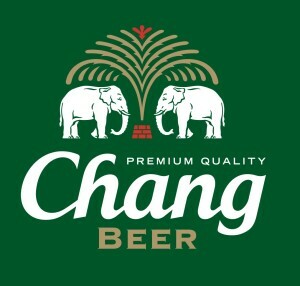 But I’m tempted to it fix to the fridge door, so the elephants without can guard the elephants within.